The Plot In 5 Sentences Or Less: Georges is a 7th grader in Brooklyn whose family has just experienced job loss and moved from a house to an apartment building. Life at school isn’t much better because he is lately the target of the class bullies. At the new apartment building, a strange boy named Safer ropes him into spying on a tenant nicknamed Mr. X. As Georges grapples with the school bullies and struggles to understand Safer’s behavior, he finds that navigating the social waters of adolescence is often times confusing but also rewarding in the oddest of moments. My Take: I greatly admired Stead’s Newberry Winner When You Reach Me (2009) and consider it one of my favorite middle grade books. I enjoyed Liar & Spy, but it was a less pleasurable reading experience for me. Stead has a gift at creating characters for realistic fiction that are believable, quirky, and endearing to the reader. I enjoyed getting to know Safer and the odd world that he inhabits in his mind. I did feel that there were some minor problems with the plot. Georges’s father seems to contain secrets in his sadness that are never fully fleshed out and there is a plot point involving the mother affixed near the end that feels unnecessary. Still, this is an enjoyable read about a middle schooler in transition. One Interesting Note About The Author: According to her website, before her writing career, Rebecca Stead was a public defender (she thought being a writer was impractical!). The Plot In Five Sentences Or Less: It is Christmas break and Milo is hoping to use his time off from school to rest and relax. Unfortunately, he lives with his parents in an old house turned inn located in the town of Nagspeake. As soon as he settles in with his books and hot chocolate, Milo’s vacation is interrupted by a strange group of characters that arrive at the inn. When some of the guests’ items go missing, Milo and his friend Meddy are drawn into deeper mysteries about the history of the house and the people that once lived there. My Take: This is a finely realized mystery that will appeal to advanced elementary aged readers who do not mind wading through some exposition. 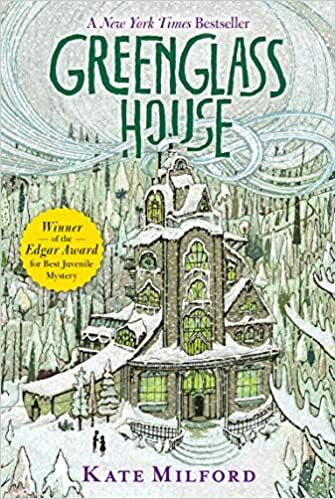 I admire Milford’s ability to develop the world of Nagspeake and Greenglass House and to settle the reader in this interesting environment. I did find myself wishing for a mystery that was more finely focused on one point rather than spreading it out between the relationships of the guests, the missing items, and the history of the house. The Plot In Five Sentences Or Less: Red is a scarlet oak that has stood in a neighborhood for 216 years. The local people use Red as a wishtree, writing wishes onto scraps of paper or cloth and tying them onto the branches. When a Muslim family moves into a house close by, Red and its companion animals befriend the daughter named Samar. But when an act of hate targets Samar’s family, Red finds that she must take a more active role in protecting the people and animals in her neighborhood. One Interesting Thing About The Author: Katherine Applegate is not only the author of The One And Only Ivan, 2013 Newberry Medal Winner, but also the Animorphs series. The Plot In Five Sentences Or Less: Ethan and his family are moving from Boston to a small town in coastal Georgia, seeking a new start after a traumatic experience involving Ethan and his best friend Kacey. As Ethan learns to adjust to his new settings and to try to make peace with the past, he makes a new friend in Coralee, a lively girl who helps Ethan settle into his new life. But being friends with Coralee also brings its own complications, some that remind him of his painful experience with Kacey. As Ethan and Coralee’s friendship deepens, they discover that the past has a way of resurfacing in painful ways. My Take: This was an excellent read and I can understand it’s inclusion on a lot of mock Newberry lists this year. Ethan’s pain is convincing and as readers we are pulling for him to find some way to resolve his grief and find solace in his new relationships. Standish does employ some well worn tropes (the mean girl, the bully, etc.) but none of that should bother younger readers. I definitely recommend this to anyone looking for good realistic fiction about trying to make peace with the past. One Interesting Note About The Author: According to her website, when Ali Standish was young, she and her mother would play a story game. Ali would give her three things (like blueberries, a panda bear, and a snowy forest, for example) and her mother would be challenged to create a story out of it. The Plot In Five Sentences Or Less: Every year the members of the Proctectorate have taken an infant and left it in the woods as a sacrifice to the witch. Unbeknownst to them, the witch, who name is Xan, has shepherded each baby to another town so that it can be raised by a loving family. One year, however, Xan accidentally feeds a baby with moonlight, thereby enmagicking it. She names the girl Luna and raises her by her side. As Luna’s powers develop, her past comes calling in the form of two women: one that has gone insane and another that feeds on sorrow and prowls with a tiger’s heart. My Take: This was an engrossing read and worthy of its winning the Newberry Medal. Barnhill has the ability to create a fantasy world that is convincing but not indulgent. Her writing moves the narrative along at a good clip while also taking the time to build the characters. I particularly appreciated that so much of the story revolves around, in several forms, a mother’s attachment – or lack thereof -for her child. You can tell that Barnhill enjoys exploring this subject from several different angles, ultimately arriving at a positive answer. The Plot In Five Sentences Or Less: Annabelle is a 12 year old girl living on a farm in rural Pennsylvania in the autumn of 1943. Betty is a new girl at school who jumps Annabelle on her way home one afternoon in the deep recess of Wolf Hollow, a low, dark place that runs between the school and Annabelle’s farm. Betty threatens to beat her with a stick and hurt her younger brothers if she tells anyone. The one witness to this cruelty is Toby, a local homeless man with a mysterious past who wanders the local woods. The tension culminates is a violent incident that turns the town against Toby and makes Annabelle realizes that she is the only person who can protect him. My Take: This was a book that gripped me from the opening pages and then expanded into a conversation about larger themes. I appreciated that author Lauren Wolk takes no time in introducing the character of Betty Glengarry who immediately provides a source of danger and conflict. She’s a wonderful antagonist that fills the narrative with a tension that makes you want to continue reading. Later on, as we get to know the character of Toby, we are asked to make sense of a more complicated character: a man who is obviously troubled, perhaps dangerous, but also show signs of warmth and kindness. When we learn the source of Toby’s demons, we are hoping that the community will show wisdom and patience in how it treats with him. This is a wonderful book that will encourage readers to ask questions about the homeless, the mentally ill, PTSD, and the ambiguous consequences of deception. I can certainly understand why Wolf Hollow won a Newberry Honor earlier this year. One Interesting Note About The Author: Lauren Wolk has a new book out entitled Beyond The Bright Sea that is already creating some Newberry chatter for 2018. The Plot In Five Sentences Or Less: Fish Girl is a mermaid who lives in a water tank at a private ocean attraction aquarium. The owner is a man who claims, and Fish Girl initially believes, to be the ocean god Neptune who tells her that he saved her and that she must stay hidden from everyone else. A girl named Livia spots her and begins regularly visiting with her and informing her of the outside world. Fish Girl yearns to break free from the tank and to learn more about her past and what the wider world is like. She begins to take risks, to defy Neptune, and eventually find where she belongs. My Take: I am so impressed by this book. Library patrons often ask me for something like CeCe Bell’s El Deafo or any of the graphic novels by Telgemeier. I feel like Fish Girl would appeal to these readers looking for a strong female protagonist. Culturally, Fish Girl also feels very relevant to the times in which we live. For those who participated in The Women March in D.C. or are interested in promoting the ‘She Persisted’ philosophy, Fish Girl will hold a lot of appeal. One Interesting Note About The Author: Donna Jo Napoli has a LOT of pictures of her family on her website! It’s kind of neat because you don’t see that too often!